Welcome to Graceful Lady Inc.
Grace Joshua - a charming, delightful lady, is a highly qualified personal and professional consultant. 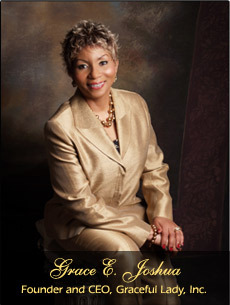 Grace is a certified color and style analyst, communications expert and instructor in manners and etiquette. Individual and group presentations are available. As we all know, image is important. 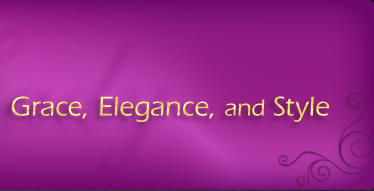 At Graceful Lady, striving for the greatest level of success is the primary goal. The business of image and etiquette is like being on stage. Your performance and presence has to be impeccable in order to achieve the highest form of excellence. It will be my pleasure to exceed your expectations. I promise you a solution that will fine-tune skills and enable you to communicate better. I will sharpen your overall presence, bringing about changes that will transform you into a graceful lady or elegant gentleman. You will be a masterpiece. Would you like a passport to a better life? Do you want that first memorable impression? Are you searching for that positive look of success? See how this program will enable the transformation to a new you. This program is for the business savvy man who does not have a clue about fashion. Change your look and improve your wardrobe. Update your attire and increase your worth. Let's add value to the next generation. Teach them good habits that will create great ambassadors for the future. To find out more, please select from one of the programs below.